LP met een gewicht van 180 gram, gemaakt in Duitsland door Speakers Corner Records. Puur analoog, audiofiele mastering vanaf de originele mastertapes. Originele uitgever: Deutsche Grammophon. Leveringsomvang: 1 x 33 toeren langspeelplaat in een LP cover (350gr/m2) met gevoerde binnenhoes. Planète Disque verpakt iedere LP zorgvuldig in een stevige doos met opvulkartons en een luxe plastic buitenhoes van PVC. 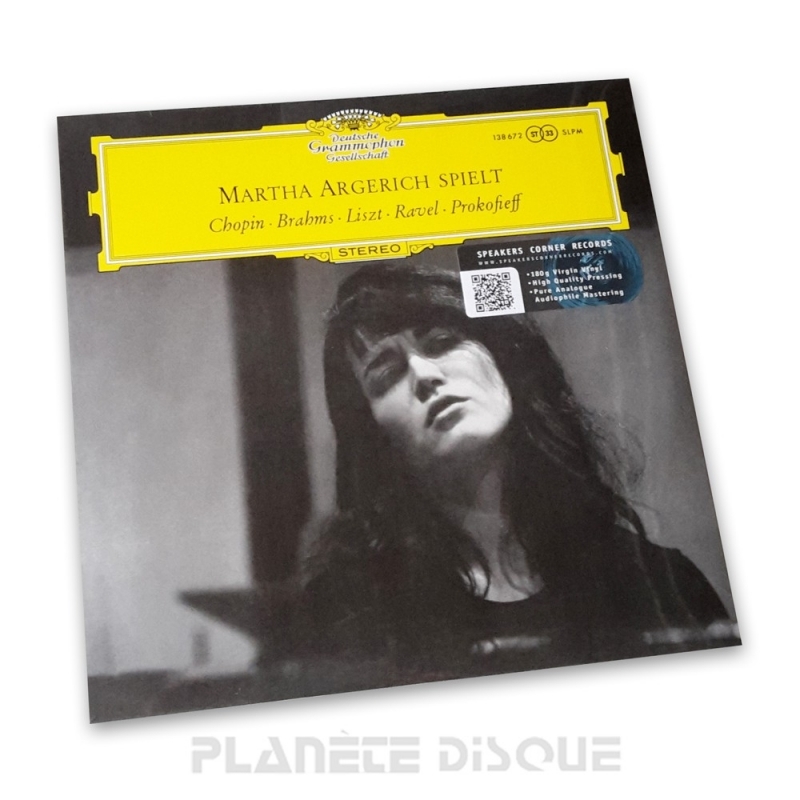 The debut recording by the Argentinian pianist Martha Argerich took the public by the storm all over the world – and the applause has still not subsided! A mere glance at the repertoire shows that she was reaching for the stars. To bring five composers together on an LP of roughly 45 minutes length means nothing other than speaking five different musical languages – and Martha Argerich proves herself a master of them all! The demonic opening of the Scherzo in C sharp minor gives way to an iridiscent dialogue which sings and sparkles beyond compare. The Barcarolle rocks gently along; Prokofiev’s Toccata is filled with dynamic force and nervous agitation; Ravel’s Jeux d’eau is pensive and introverted, with the water rippling in a circular motion. As a contrast, the two famous Brahms Rhapsodies are performed with passion, impetuosity and occasionally the required heaviness. This recording is surely one of the brightest candles to burn anew on Deutsche Grammophon’s birthday cake. This record was part of the 3-LP Set “The Conductors“ and is now available again.